Most people thing of Louis Vuitton when you ask them to name a top French trunk-maker. There is another - Goyard. Edmé Goyard was for over thirty years a partner in a small business making wooden chests and trunks. In 1853 his son, François, bough ou the other owner and the company Goyard was founded. In 1892 Edmond, Grandson of Edmé, started using the chevron design which was a very familiar sight on trains, boats and in expensive hotels for decades. 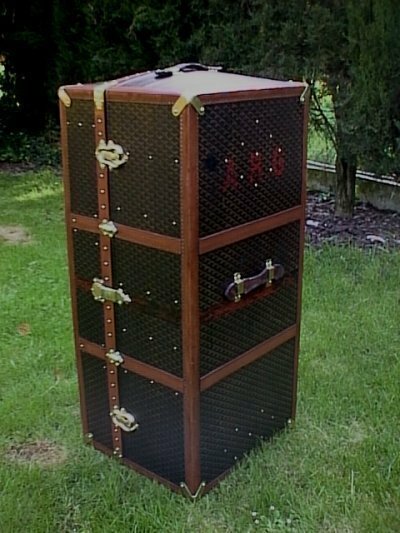 They had a similar range of car trunks, wardrobes and shoe trunks to Vuitton and a similar client-liste. Goyard seemed to be forgetten a little in the second half of the last century but the company changed hands and Goyard is now experiencing new popularity. We have always loved Goyard trunks. They display a similar level o craftmanship to Vuitton. They are simply a little less well-known but sometimes discreet and less well-known can be a goog thing.